The New Akiles CoilMac Plus is a new and improved version of the classic CoilMac M Manual Spiral Coil Binding Machine. This machine includes the solid construction and great set of features that have made the Akiles Coilmac line of binding machines famous. However, it provides a number of features that are simply not available on other comparable binding machines. The New CoilMac Plus offers oval punching holes to help make inserting coils easier than ever. It also includes fully disengageable punching pins to allow you to punch virtually any document length. The CoilMac Plus series of machines is the only line of manual coil binding machines to offer these options. Plus, the Coilmac Plus offers a 0.248 pitch to help ensure that the holes aren't too closer or too far away from the edge of the paper. The Coilmac-M+ is perfect for users who are looking for an all metal sturdy coil binding machine but don't feel that an electric coil inserter is necessary or already have a stand alone inserter. The Akiles CoilMac M+ is an excellent coil binding machine which is built to last. Akiles CoilMac Plus renders efficiency and productivity. Its high quality components and full range of functions make it the most complete and durable equipment in its class, ideal for higher volume binderies and copy centers. Fully Disengageable Punch Pins: For a clean punch with virtually any document length. Oval Punching holes to help improve spiral coil inserting. Includes: Waste drawer, spiral coil selector. I was evaluating whether or not to buy this model (note the slightly oval holes) or the one with the round holes. After binding some fairly large texts (300 pp+) I'm so glad we chose this model over the other-- there is minimal tearing and wanting to pull loose from the coils. Unlike some of the other machines I've used, this one is truly "heavy duty," and you'll know it as soon as you pull down on the over-sized handle. If you need one, buy this one. Made like the proverbial tank...exactly! Except for the wooden handle and the crinkle finish aluminum siding, ALL of this machine is heavy gauge STEEL....I didn't think they made stuff like this anymore! Easy to put together, a joy to use. If you need a coil binding machine, just bite the bullet and get this one; you will NOT regret it! Precise, powerful, smooth. One little caveat...the hole they drilled for the substantial thumb screw which holds the blue plastic book guide in place was one size too small for the screw. If you find this has happened to you, just go to Ace Hardware and get a 9/64" brass screw and washer. Works great. Heavy duty metal construction and the oval holes make it easier to insert the coils. Seems like a solid machine and it is fairly easy to use. Welcome to MyBinding video. 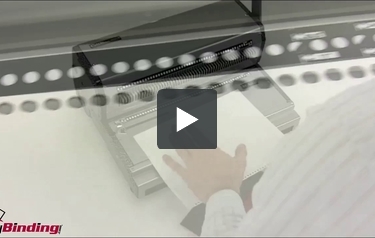 Let’s have a look at the CoilMac M Plus, a manual coil binding machine by Akiles. Solid, simple, versatile, and yet still economical, the CoilMac M+ is a great binding system. Let’s watch it in action. A full row of disengageable die pins allows you to punch virtually any size sheet of paper and assure that there are no half holes. Use the side margin control knob to set your margins in place so that all holes are punched consistently throughout your entire project. The depth of margin control knob provides the correct punch margin depth for each coil size and maximizes the document’s tear resistance. And the oval hole punching makes it not only stronger but easier to insert the coil. It’s wise to use scrap paper for your first punch to make sure things are all perfect. Then begin punching with the covers, the bind side in. Pull the lever all the way down and your punch is made. Continue on through the rest of your project, punching up to 17 sheets of 20lb paper per lift. With your project all punched, it’s time to bind. All CoilMac machines come with a coil diameter selector. This is just a simple tool whereby you can judge the size of coil that you need for your project. One side you measure your project and get your reading. Then set the other side and select your coil. The CoilMac M+ comes with an extendable inserting table. This expedites the inserting of coils. There are two pieces to assemble. We’ll call them the fence and the teeth. This is the fence. Place the blue piece down and twist it tight with the knob. Second, place the teeth down. Remove the small nut from that twist knob, find it underneath the machine, line it in place, and screw it down tight as well. Turn the whole unit around and snap it right onto the end of the machine. Threading one end of your project onto the teeth, hold it into place, and you can begin to insert your coil by hand. And once you’ve threaded the first few holes, you can use your hand in the groove to slide things along much faster. Remove your project, twist to the end, and finish off your whole book by crimping both ends. Feel free to check out our How To video on crimping coils. And there it is. That’s a book bound on the CoilMac M Plus. And for more demos, reviews, and how to’s on this product and many more, check out MyBinding.com. Transcript: Welcome to MyBinding video. This video compares the CoilMac M with the CoilMac M Plus. First, let's start with the similarities. They both have the same pitch of 4:1. They both have a 13-inch punching length. Both have an open throat design which allows you really to use any size document. Punch capacity on both machines is up to 17 sheets of 20lb paper. And the binding capacity is 25mm. They both weigh 35lbs and include an inserting table, which expedites the inserting of the coil, reducing costs and binding time. And finally, both of them come with a coil selecting tool. Welcome to MyBinding video. This video compares the CoilMac M with the CoilMac M Plus. First, let's start with the similarities. They both have the same pitch of 4:1. They both have a 13-inch punching length. Both have an open throat design which allows you really to use any size document. Punch capacity on both machines is up to 17 sheets of 20lb paper. And the binding capacity is 25mm. They both weigh 35lbs and include an inserting table, which expedites the inserting of the coil, reducing costs and binding time. And finally, both of them come with a coil selecting tool. There are two main differences between the M and the M Plus. The first is the number of disengageable die pins. And the second is the type of hole punched. The M+ has fully disengageable die pins, meaning every single one can be removed. Therefore you can punch virtually any size sheet of paper while the M model has only five disengageable die pins to be used with the most common sizes of paper. The M model punches circular holes that are 4mm in diameter while the M+ model punches oval shaped holes. The difference is oval holes tend to work better with thicker documents. Also, oval holes are easier to begin the threading process of the coil onto the spine. So the choice will be yours according to what you need. The CoilMac M runs just under $350 and the CoilMac M+ runs just under $400. For more comparisons, demos, and how to's, check out MyBinding.com. The Akiles Coilmac Plus is a new updated and upgraded version of the classic Akiles Coilmac M which has been one of the most popular manual spiral coil binding machines for years. This machine is designed to bind documents using standard 4:1 pitch spiral coil binding spines. The Coilmac+ is a heavy duty metal spiral coil binding machine designed for small and medium sized businesses that need to bind a few documents at a time with coil binding. It is a great introductory model for organizations that need a dependable and durable binding machine for their office but don't want to spend a lot of money. The Akiles CoilMac Plus features the same durable metal construction that has made the line of Akiles binding equipment famous. They have a reputation for building equipment that is extremely strong and durable. This machine is no exception. The machine is made almost entirely out of metal and is designed to last years without ever needing service or maintenance. When Akiles released their plus line of binding equipment they made several significant upgrades that are worth mentioning. They changed the holes that the machine produces from round to oval. The new oval hole pattern makes it easier to insert coils and also makes it easier to turn the pages of your bound books. This is a great feature and the CoilMac M+ is one of the only manual binding machines available on the market that includes this feature. Akiles also modified the hole pattern used by this binding machine. The Coilmac-Plus uses a 0.248 hole spacing instead of 0.250. This means that the machine punches 44 oval holes as opposed to 43 round holes. The 44 holes fit better on an 11 inch binding edge than the typical 43 hole round pattern. This machine also offers fully disengageable punching pins. This allows users to punch virtually any size of document. Any hole along the punching edge can be disengaged making it possible to punch documents that are less than 1 inch in length. It also has a continuous punching guide to allow users to punch and bind 8.5" x 14" legal sized documents and 11" x 17" tabloid size documents. In addition to all these other features, the Coilmac+ also includes a pull out coil inserting table to help users to increase productivity when manually inserting spiral coils onto their documents. Although Akiles has added a huge number of new features to this binding machine, it is ultimately still a manual binding machine. The CoilMac Plus does not include an electric coil inserter. This means that users will have to manually spin the coil onto their documents by hand. Users who bind ten or less documents at a time my not find this to be a problem. However, higher volume users may really want to upgrade to a machine with a coil inserter. 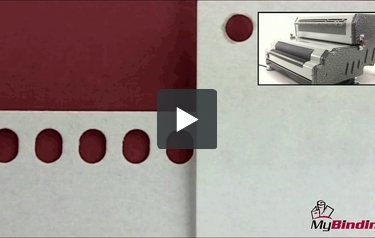 This machine offers a punching capacity of approximately seventeen sheets of paper per lift. Although this is reasonable for most small and medium sized offices, higher volume users may want to consider a punch with a larger punching capacity or an electric punch with foot pedal operation. Although the oval hole design offered by this machine makes it easier to insert coils and easier to turn pages, many users are used to using a round hole pattern. Whichever pattern you prefer, it is important to note that the hole patterns are not interchangeable and you can not use this machine to punch pages for insertion into a 0.250 pitch round hole coil bound document. In releasing the CoilMac Plus binding machine, Akiles made huge strides to improve on their already highly popular design. The oval holes, disengageable dies and new hole spacing make this machine a definite winner and helps to set it apart from the competition on many different levels. These changes make this machine our favorite coil binding machine that we have reviewed. However, it is still not a good choice for high volume users. Organizations that need to bind large numbers of documents will want to consider a machine with an electric coil inserter and possibly an electric punching mechanism. Thank you for your question. The 2 main differences Akiles Coilmac ECI+ and the Akiles Coilmac Plus Manual Oval Hole Coil Binding Machine are that the Akiles Coilmac ECI+ has a electric punch and coil inserter and the Akiles Coilmac Plus is a manual punch that does not have a electric inserter. 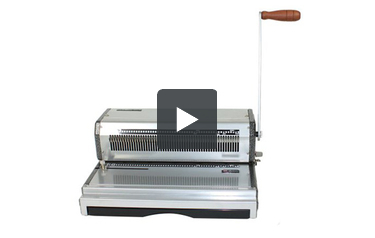 does the coilmatic plus oval manual coil binding machine come with a crimper? Thank you for your question. The Akiles Coilmac Plus Manual Oval Hole Coil Binding Machine does not come with a crimper. We have them available on our website here . Is there storage in the machine to hold coils or no? Thank you for your question. Unfortunately the Akiles Coilmac Plus does not have any internal storage for coils. What are the dimensions of this machine- need to see if it will fit in a certain location? Thank you for you question. The Akiles Coilmac Plus Manual Oval Hole Coil Binding Machine measures 18" wide x 13" deep x 18" high (including handle) . Where can I find coils to go with this machine? Yeah. We carry a ton of 4:1 pitch coil for use with the Coilmac Plus. Just visit our coil binding supplies section and choose the color and size that you need. All of the standard 4:1 pitch coils will work.